Keep it here for the latest on the Redskins 2014 NFL Draft picks. 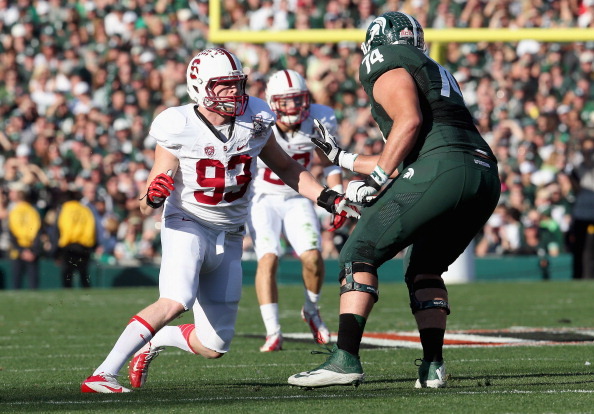 The Washington Redskins selected Stanford linebacker Trent Murphy in the second round (47th overall) of Friday’s NFL Draft. A 2013 consensus All-American, Murphy, 6’5″, 250 pounds, started all 14 games at outside linebacker for the Cardinal in 2013. He led the NCAA with 15 sacks last season and recorded 62 tackles with 23.5 going for a loss. Murphy can play as hybrid standup linebacker/defensive end. A knock on Murphy is his slight upper body frame in comparison to most NFL linebackers but is praised for his motor and energy. Linday’s Magazine Pro Football Draft Preview compared Murphy to Chicago Bears defensive end Jared Allen. Here’s a highlight video from Murphy’s time at Stanford. 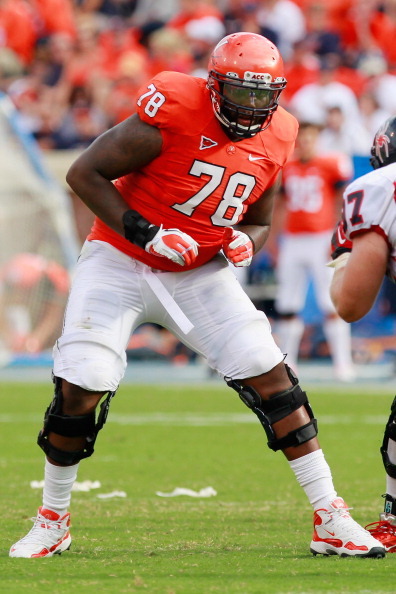 With their first of two third round picks, the Redskins selected 6’6″, 314 pound offensive tackle from the University of Virginia. The Richmond, Va. native started all four years of his college career, including all 12 at left tackle in 2013. He will move to right tackle to compliment Trent Williams as a duo of bookend tackles. Moses was projected early on to be a first round pick, then later a second round selection and slid to the Redskins at the third round. The team needed an upgrade at right tackle and look to have it with the massive Moses. 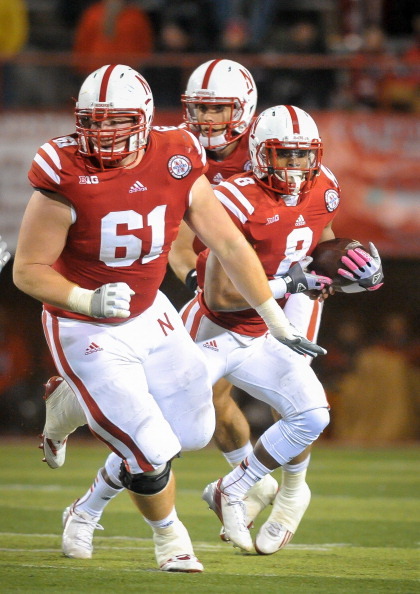 With their third pick of the night, the Redskins continued to address the offensive line by selecting former Nebraska walk-on Spencer Long. The 6’5″, 320 pound guard played only six games in 2013 before tearing his right MCL. He started 33 career games as a Cornhusker. He played all 14 games in 2012 with a torn right meniscus. The Redskins opted to address the secondary with the first selection of day three of the draft. Strengths: Fluid athlete. Quick-footed and loose-hipped. Can shadow, mirror and stay in phase. Plays with a sense of urgency and is aggressive supporting the run. Gives effort to pursue from the back side. Weaknesses:Needs to bulk up and get functionally stronger. Gets wired on blocks. Lacks ideal speed. Average explosion and leaping ability. Plays into the boundary. Tends to play out of control and his tackling technique needs work — misses too many. 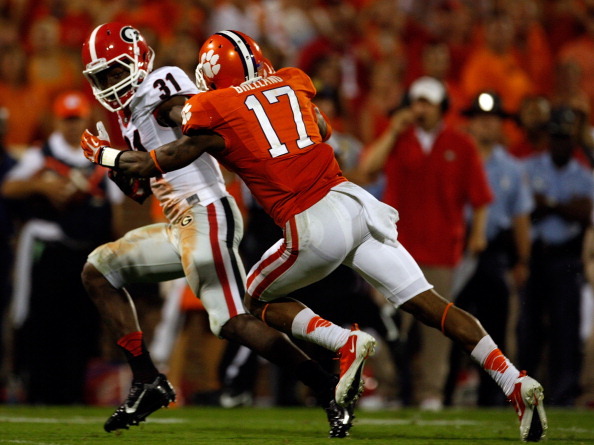 Exposed vs. Florida State’s Rashad Greene. Bottom Line: Lean, rangy cover corner who sticks his nose in run support and competes against bigger receivers. Is relatively raw, but has an appealing temperament and moldable tools. Overview: Prepped in Texas. As a true freshman in 2009, appeared in nine games and recorded nine receptions for 39 yards (4.3-yard average) and a touchdown. Started 6-of-12 games in ’10, tallying 33-515-4 (15.6). Started one game in ’11, but was granted a medical hardship because of season-ending hernia injury. Returned to start all 12 games in ’12, snagging 76-1,149-6 (15.1). Led the team in receiving for the second year in a row in ’13 when he started 12-of-13 games (gave way to two tight ends against Syracuse) and produced 77-1,039-9 (13.5). Strengths: Good size. Smooth accelerator off the line. Good flexibility to sink his hips. Tracks throws and shows terrific body control to adjust. Impressive hands catcher — quick, soft mitts. Makes NFL-caliber catches, snatching throws out of the air away from his body. Determined runner with the ball in his hands. Nice upfield quickness to pick up yards after the catch. Good field awareness. Weaknesses: Could stand to improve functional strength and physicality. Can be jammed and rerouted at the line. Pedestrian speed. Is an unpolished route runner and does not consistently separate — drifts into patterns neglecting deception and does not snap off breaks. Limited route tree. Marginal blocker. Appears lackadaisical at times — intermittent intensity, urgency and compete level. Questionable courage to work the middle of the field. Bottom Line: Productive, monotone, unrefined, enigmatic mid-major receiver with one of the best pair of hands in the draft, though he comes with concerning tweener traits he will have to overcome. Lacks ideal speed and physicality to survive outside and lacks ideal suddenness and toughness to thrive inside. Workout numbers will be critical. Overview: First name is pronounced “Lake.” Ranked as a Top 5 overall prospect as a Texas prep after rushing for 4,217 yards and scoring 52 total touchdowns. Was also an accomplished track athlete, competing in the 100 meters (personal best 10.33 seconds) and the long jump (21-8). Began his career at Oregon in 2010, where he traveled but did not play and redshirted. It was later discovered that his advisor, Willie Lyles, accepted a $25,000 payment from Oregon after he signed his letter of intent. Oregon was placed on three years probation and lost some scholarships as a result of the NCAA investigation. Decided to transfer because he thought “something was about to go down” at Oregon and because of his grandparents’ bad health ended up at Baylor. Had to sit out the ’11 season due to NCAA transfer rules and lost a year of eligibility. Played in a game for the first time in three years in ’12 and was named the Big 12 Offensive Newcomer of the Year. Carried the ball 131 times for 1,012 yards (7.7-yard average) and seven touchdowns in 13 games (six starts) after starting slowly — had only 181 yards after seven contests but amassed 831 yards in his final six contests. Grabbed nine passes for 107 yards (11.9) and one touchdown. Led the Big 12 with 107.0 yards per game in ’13 after recording 158-1,177-11 (7.4) on the ground in 11 games (eight starts). Suffered a groin injury against Oklahoma and missed the next two games (Texas Tech, Oklahoma State). 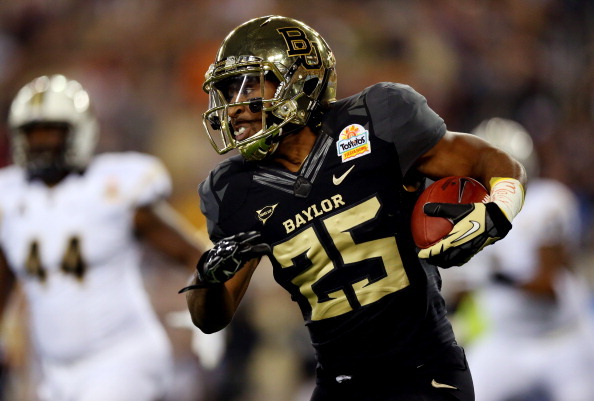 Is the first player in Baylor history to top 1,000 yards rushing in multiple seasons. Five of his 19 touchdowns came on plays of longer than 68 yards. Quick-footed and nifty with very good competitive speed to pull away in the open field. Deceptively fast. Keeps his feet churning on contact and can elude the first tackler and power through arm tackles. Runs low to the ground with good lower-body strength. Weaves through traffic and has a knack for hitting cutback lanes. Very good run balance to stop and start. Had the best vertical jump (41 1/2 inches) and broad jump (11-2) of any back at the combine. Weaknesses:Does not run big or keep his shoulders squared to the line. Will press and try to do too much — can improve patience and do a better job of letting his blocks develop. Very limited career receiving production. Played in an offense that featured big running lanes and helped inflate his production. Can be tracked down from behind. Beats to the tune of his own drum and can be susceptible to hanger-ons. Bottom Line: Good-sized, productive, zone runner with enough physical traits to warrant consideration as a complementary back. Benefited from an offense featuring a lot of fly sweeps and lateral runs that have not translated well to the NFL game. Overall character will require closer evaluation and can determine draft status. Overview: John Mackey Award semifinalist in 2013. 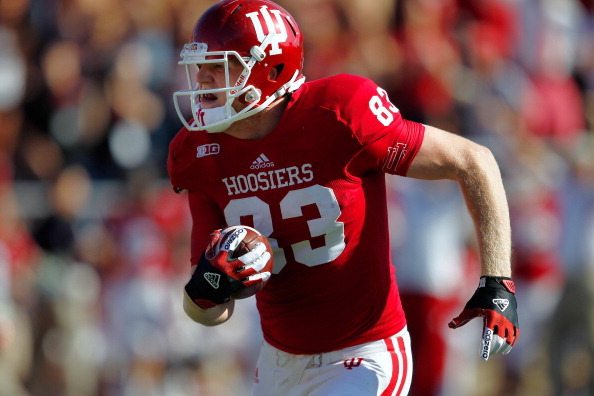 Set IU TE career records with 117 receptions, 1,337 yards, 15 TDs. 2013: Honorable mention All-Big Ten. Back-to-back 2-plus TD games vs. Indiana State, Navy. 2012: Started all 12 games. Finished fourth on the team with 41 receptions. 2011: Played all 12 games, starting 6. Had 54 yds, 1 TD vs. Penn State. 2010: Played all 12 games, starting 7. Set school records in receptions, yards and TD for freshman TE. 2009: Redshirted. High School: No. 41 TE in nation (Rivals). 63 receptions, 845 yards, 11 TDs as senior in Ohio. Strengths: Good size and enough strength to fend off the jam. Catches outside his frame and adjusts to the ball. Has a wide catching radius and presents a big target. Weaknesses: Has very small hands and short arms. Lumbering mover. One-speed route runner with minimal burst and acceleration to separate. Much of his production is schemed — creates little on his own. Can be phased by traffic (hears footsteps) — hands are suspect. Struggles sustaining blocks (falls off and is controlled too easily). Tends to play tall and upright. Bench-pressed 225 pounds only 19 times at his pro day. Bottom Line: Could battle for a roster spot as a short-area receiving target. Aligns in the backfield, in the slot and on the line, yet offers little as a blocker. Overview: Led team with 104 points in 2010, connecting on 16 of 19 field-goal attempts with a long of 51 and all 56 extra-point tries. Broke the school record for points by a kicker in 2011 with 118 after making 21 of 27 FGs with a long of 50 and 55 of 57 PATs. Also kicked off 93 times for a 67.8-yard average with 40 touchbacks. In 2012, made 11 of 18 FGs with a long of 46 and all 32 PATs, and kicked off 58 times for a 64.7-yard average with 39 touchbacks. In 2013, hit on 13 of 15 FGs with a career long of 54 and all 28 PATs, and kicked off 50 times for a 63.2-yard average with 34 touchbacks. Also punted seven times for a 45.7-yard average with a long of 77 and one inside the 20-yard line. 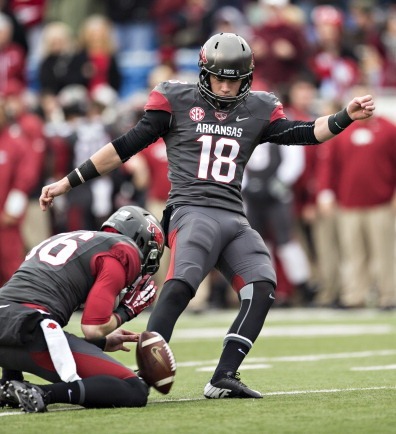 Led the Razorbacks in scoring each season and holds school records for points by a kicker (354), FG percentage (77.2), PATs made (171), PATs attempted (173) and field goals (61). Strengths: Good leg speed. Consistently converted beyond 50 (3-4 as a senior) and has enough velocity to hang the ball on kickoffs. Well-grounded and humble. Weaknesses: Thinly built and undersized. Does not possess a powerful leg. The ball does not explode off his foot (rise). Struggled to handle pressure early in his career. Bottom Line: Soccer-style kicker whose leg strength and accuracy seemed to be weakening heading into his senior season, with diminished accuracy and range. Rebounded to make his senior season his best. Could warrant consideration in a camp.